Do you know why this guy is singing? Because he's happy. And do you know why he is happy? Because he won an Apple iPad in our Apple Tablet Sweepstakes. 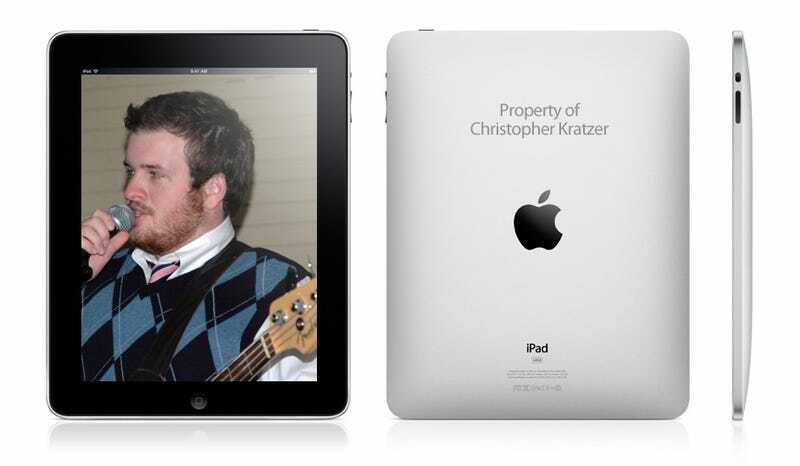 His name is Chris Kratzer. Like we said in the sweepstakes rules, we eliminated the questions that didn't have a clear answer. In some cases, like the screen size, we took the the closest answer as the correct one (10.1 inches is near enough 9.7 inches). Only nine people out of 37,382 were right. We put those in a list sorted by date, and then ran a random number generator, which gave us the number three. Chris was in that position. Chris works in ITS at Auburn University-Montgomery, where he's also a senior in Marketing. I asked him what was his answer process and he said that he "went with my gut on most of them, and rumors that you guys posted that seemed likely." He believes the is "gorgeous, and the ten hour battery life is really amazing." Like many, he was "really shocked that it did not support background apps" but, also like many, hopes that "will come with the next OS update." The tablet "is nothing that I need, but everything I want..." he says, but at the end, he wants it mainly for "watching movies and reading books." Congratulations Chris, and thank you all for playing!